North Suburban Synagogue Beth El is privileged to have a Torah scroll from the Czech Memorial Scrolls Trust, an organization in London that collected scrolls that survived the Holocaust. Hand-carried to the synagogue from London in 1980 by Judith and Roger Leff, scroll #44 from the Memorial Scroll Trust will be back on view when a new display is complete, hopefully in the fall of 2018. Our Torah scroll was revered by the town of Prostejov (Prossnitz in German) located in central Moravia, the historical country of what is now the eastern part of the Czech Republic. Prostejov was a center for the textile and ready-made clothing industries, in which Jews played an important part. A synagogue, dedicated in 1676, and the Prostejov Yeshiva attested to a vital Jewish community until the Nazis invaded in March 1939. 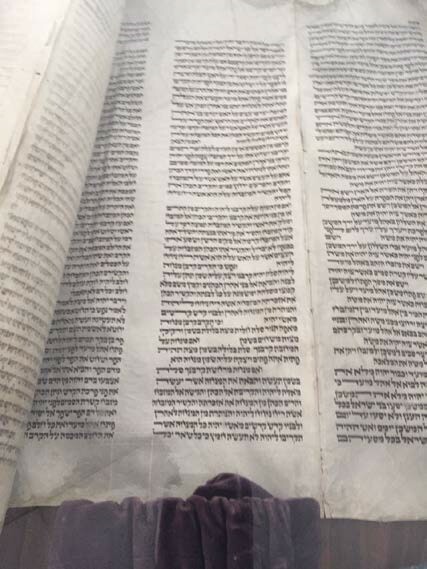 The synagogue closed in July the same year and our scroll, written in the 1800s, was confiscated and transferred to a synagogue in Prague, where with 1,563 other Torah scrolls it laid unused and unattended for nearly twenty years. Then, in 1964, it was rescued and traveled to the Westminster Synagogue in London as part of the Czech Memorial Scrolls Trust. As part of our loan agreement with the Trust, our scroll was examined by Rabbi Yochanan Salanter from Sofer On Site, Miami. Due to its excessively torn parchment and damaged script, our scroll is not kosher, but serves as a teaching tool that deserves a place of honor as a surviving Holocaust treasure.